The Marquetry Centre - » Why Us? Yannick Chastang has over 20 years of experience in designing and making bespoke pieces to fit all budgets and requirements. His aim is to make furniture of unrivalled excellence. He makes use of some of the most exotic and luxurious materials available today, from rare hard woods, to mother or pearl, to shagreen. He uses exclusively saw-cut veneers which are thicker and more true to the grain of the wood than the more common sliced variety. 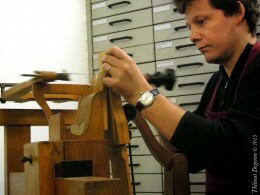 His furniture is made using both traditional and innovative cabinet-making techniques and combines the best of old and modern products and methods of manufacture. Marquetry plays an important part in many of his designs, as does mechanical ingenuity. His designs tend to have strong French and Classical influences derived from his close relationship with eighteenth-century and Art Deco original pieces, gained while working as a museum conservator. Where appropriate, he likes the sympathetic addition of chased bronze.